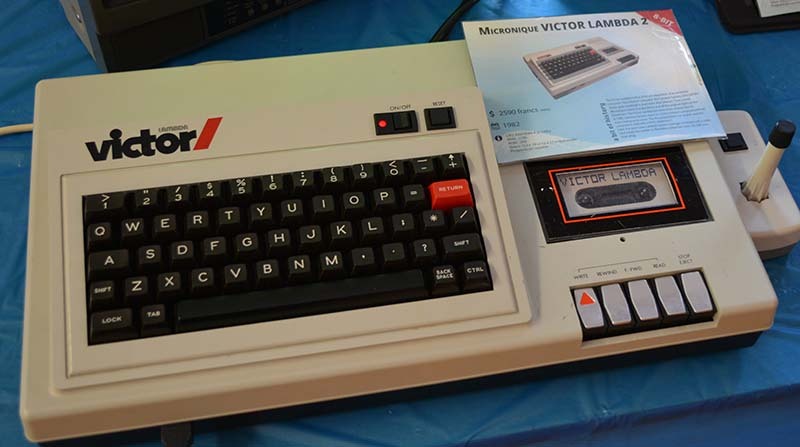 The evolution of the reigning champion of this exhibit begins with the Micronique Victor Lambda, a licensed copy of a purely American computer, the Interact Home Computer System. This computer featured a 2 MHz 8080A, 8 or 16 kB of RAM, and was quickly discontinued. The French company Micronique quickly bought the original designs and remarketed the computer in France. In a few short years, Micronique took this design and turned it into the Hector. This machine featured a 5 MHz Z80, 48 kB of RAM, high resolution graphics (243×231 at four colors) and included BASIC and Forth interpreters. The Victor and Hector were the best home computers at the time, but for every Commodore or Apple, you need a ZX Spectrum. France’s version of this tiny computer with a terrible keyboard was the Matra Alice 32, a computer with a 1 MHz 6803, 16kB of Ram, and a real 80×25 text mode. The Alice is heavily based on the American TRS-80 MC-10, with a SCART connector and an AZERTY keyboard. The weirdest computer [Jeremie], [Thierry], and [Jean Paul] brought out? That would be the Excelvision EXL100. The 1980s, for better or worse, were the times of the Z80 and 6502. The EXL100 was running something completely different. This home computer used a TMS7020 CPU from Texas Instruments, a speech synthesizer, and a wireless keyboard. Very strange for the time and relatively inexpensive; in 1984 this computer cost only ₣3190, or about $550 USD. [Jeremie], [Thierry], and [Jean Paul] had an exhibit that presented the best the Francosphere had to offer to the computing world in the 80s and 90s. We haven’t seen enough early computers from outside the US, so we’re happy to have met these guys at the 11th annual Vintage Computer Festival East.